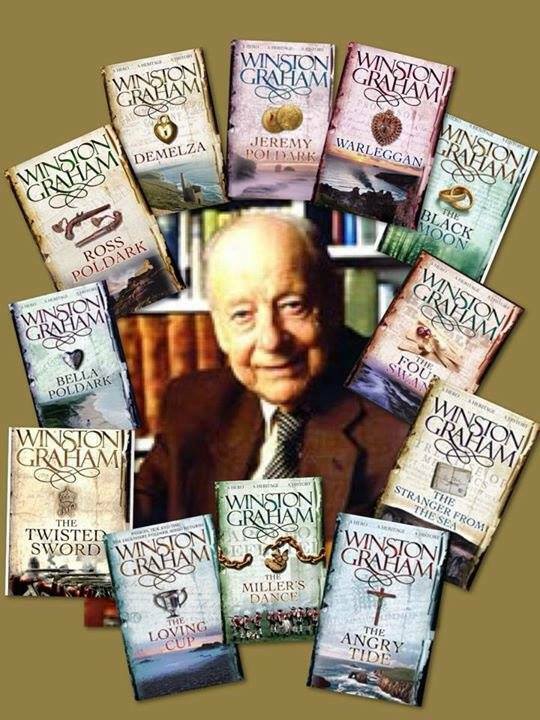 Winston Graham would have been 106 today. Hard to believe he died 11 years ago. His writing lives on and is again a source of joy as well as–in this case–employment! The filming of the new series of POLDARK is nearing the halfway point and interest is building. He wrote Ross Poldark, the first in the saga, in 1945 when he was 37. He finished the twelfth and last book, Bella Poldark, in 2002 at the age of 92! This last tells the story of Ross and Demelza’s youngest child who becomes an actress–and with whom I’m sure Winston fell in love–as he’d done with Demelza, 11 books earlier–history repeating itself! There is PASSION in the Poldark saga from the first book to the last. He loved and felt a loyalty to his characters–and this he passed on to his readers. The books will be given another lease of life when the new version is shown next year–and this is just. He was a supremely talented story teller. Thanks Winston, and many happy returns!! Mutton chops under wraps–for now! I couldn’t agree more. I have such wonderful memories of watching the series and in fact my son – now aged 31 – was named Ross as a tribute to a much loved character. I am so looking forward to seeing the new series of Poldark but there can only ever be one Ross Poldark for me !! His legacy lives on and he has brought so much joy and interest in the region and the era which generates continual interest. I was expecting twins when Poldark first aired and was persuaded to read the novels, having missed them. The twins being born in 1975. It was about 1980 when I finally read the whole lot and I was totally hooked. Winston Graham’s grasp of a woman’s mind was quite astounding. Indeed of emotions and his expression of them. He has also brought to prominence several very fine actors, including yourself. A very happy birthday to Winston and long may your books be in print! Have just started re-reading the Poldark books after a break of several years. As others have said, they are full of passion, but also brilliantly descriptive. I have to admit I’m quite excited about the news adaptation, but the original will always be special to me. I couldn’t agree more. As an author, I think Winston Graham is in a league of his own. How those stories just appeared to him, in such depth and detail, never fails to take my breath away. He was such a gifted storyteller. I’m glad his work is still being celebrated, and I can’t wait to see the new series! Before I read the novels, a friend whom I trust told me that the Poldark novels would “ruin all other books” for me. She was right! I, too, look forward to the new series, but I agree with the post that said that Robin will always be Poldark! Just reread the series, they are still a “corking good read”! Looking forward to the new series…. Thank you Graham. You will certainly enrich my English literature background, my spirit and soul. I have just begun reading the first book and I am determined to read all. And visit Cornwall at last! Happy 106 birthday Winston Graham. Thank you for all your wonderful books and especially the Poldark saga. you had a way with making the 18th and early 19th century come so vividly alive. thank you. I am sure you are looking down and smiling on the latest production. Many thanks to Mr. Graham for his great and wonderful job. Poldark made my adolescence confortable and all my life full of love for literature, culture and history. Yes, “my” Poldark will be Robin Ellis now and forever! Yes, Happy Birthday to a great story teller. He is a bit of an unknown these days (the new series will change that, I’m sure), but I’ve been recommending him to friends since finishing all twelve books a few months ago. His characters are fully-formed and his plots unexpected but believable. But I loved best the way he introduced me to all aspects of life at the time — mining, fishing, wrecking, medicine, the church, politics, war, prisons, clothing, festivals…the list is all-encompassing — without ever being pedantic. That, and his endlessly creative, evocative descriptions of the weather, which rival Ursula Le Guin’s seventy-page description of snow and ice in Left Hand of Darkness. Now that’s the mark of a master! Well, frankly, I can’t wait to see the new series. However, I am concerned that I will be disappointed in comparison with your original protrayal as Captain Poldark. We shall see. He brought Cornwall to life. I hope I get to travel there someday. Can’t wait to see the muttonchops! God the books,and run up stairs,for them and your Making Poldark, two very surprised firemen stood shaking their heads.Looking forword to seeing the new remake,and of course the mutton chops. The Poldark books are like old friends. I was acquainted with them after watching the series. In the 80’s it was difficult to find them in US bookstores and I can remember the thrill of finding two books in Scotland during a summer vacation. I now have the entire series on my bookshelf. Every so often I start the series all over again and enjoy Winston’s words as much as I did the first time. The books haven’t dated at all. I find it hard to credit that the first one was written 70 years ago. I remember reading them as a teenager and they just pulled me in and helped me to love reading. They are the only books I still own from that time and are now held together with yellowing Sellotape. I’m planning to reread them on kindle because the originals are so fragile but will always have a place on the bookshelf. I’ve just realised your brother is currently in The Crucible, Robin. It looks like a fantastic production and If I wasn’t in Australia I would love to see it. If you speak to him, please pass on my good wishes for a so nderful season. Mutton chops are hipster now- wear them with pride! Thanks Nicola–I’m trying to wear them with pride! In fact they make me laugh each time I look in the mirror! Happy Birthday Winston Can”t wait to see the new series Poldark . It will be equally good because you are in it Robin. I wished i lived in that time most of my family on my mothers side was born in Wales. I too have a set of Poldark books from 1975,also fragile but treasured,I went to a few of the Poldark lunches a few years ago and had a wonderful time meeting everyone, i look forward to seeing the new production, i hope it comes to Australia but Robin will be the only Ross Poldark for me. Such a talented writer. What an observing and perceptive insight, Mr. Ellis. English is not my native language, but I always felt this vivid passion you’re talking about. It infiltrated despite the lack of language while I was reading. I didn’t know about the “Bella Poldark” one. Thank you and all the best.